Recent news from Australia raises serious concerns about the future development of its domestic uranium industry. While established players are exiting the market, others are lining up to explore new areas and have made some positive moves. 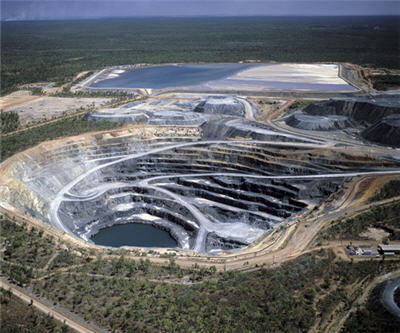 Open-pit mining operations at Ranger mine were terminated at the end of November 2012. To this date, Ranger mine was one of the largest uranium production centres worldwide with a total cumulative output of more than 100,000 tonnes of uranium oxide. On Dec. 7, 2012, the operator of Ranger mine, Energy Resources of Australia Ltd. (ERA), announced that work on backfilling the pit had already started, with the first phase to be completed by the end of 2014. During the first stage of rehabilitation, 30 million tonnes of material will be placed into the pit. This means remaining uranium reserves and resources in-situ attributed to the mine totalled 88,350 tonnes of uranium oxide (as at Dec. 31 2011, excluding stockpiles) with the average uranium grade of roughly 0.12%, will be abandoned. Just for comparison, the current uranium grade coming out of the Rössing open-pit uranium mine in Namibia amounted to only about 0.03%. What were the main reasons that ERA was forced to accelerate decommissioning of this still high-profile uranium asset? In recent years, plans on further development of the Ranger project were changed constantly. ERA considered different options, from life-of-mine expansion until and beyond 2021 to heap leaching and underground mining applications implementation. The production rate at Ranger mine had declined more than half, from 5,412 tonnes of uranium oxide in 2007 to 2,641 tonnes of uranium oxide in 2011. Multiple water management problems around the Ranger mine resulted in turbulence for the company. In the past, heavy monsoonal rains repeatedly flooded Ranger pits in wet seasons restricting access to higher grade ore and provoked the tailings dam to overflow with contaminated water and leak into Kakadu National Park. These problems forced ERA to suspend mining and processing operations at Ranger several times in the last five years. Finally, under the pressure of accumulated environmental issues, ERA decided to shut down Ranger open-pit mining operations at the end of 2012. Currently, ERA is examining a Ranger expansion project which consists of possible underground development of the Ranger 3 Deeps ore body. Taking into account early exploration and prefeasibility stage of this project, ERA will spend at least a couple of years understanding its technical and economic viability. Thus, mid-term perspectives of Ranger underground expansion are very vague. To meet uranium contractual supplies obligations, ERA continues to process high-grade stockpiled ore that is very limited in volume, as well as purchase uranium from the spot market. Ranger’s low-grade stockpiles, including its lateritic part with a high proportion of clay minerals, contain approximately 27,000 tonnes of uranium oxide. Its treatment, however, causes serious metallurgical challenges. Another big move may have significant implications for the Australian uranium industry in the future. BHP Billiton Ltd. (BHP) has shut its uranium division, responsible for its Olympic Dam copper-gold-uranium mine, to reflect shifting commodity priorities, and has moved management to its base metals group. This decision follows recent steps by BHP to cuts of its uranium program — from the delay of the uranium production expansion plan at the Olympic Dam project to the selling of a large Yeelirrie deposit located in Western Australia. Recent Ranger and Olympic Dam issues along with various problems related to notable Australian uranium projects like Angela/Pamela, Kintyre, Oban, Wiluna and Koongarra, amongst others, have also caused concerns about the future development dynamics of the local uranium industry. According to World Nuclear Association data, uranium production in Australia decreased from 10,145 tonnes of uranium oxide in 2007 to 7,056 tonnes in 2011. Australia is third in the world for uranium output — behind Kazakhstan and Canada — and is in first place for volume of recoverable uranium resources. Approval of a fourth uranium mine in July 2009 at the Four Mile project in South Australia, ended Australia’s 25-year-old “three uranium mines” policy, and greenlighted new uranium mine construction. Since then, Western Australia and Queensland have lifted official uranium bans, and recently announced governmental co-funding of uranium exploration activities in Western Australia. Thus, despite current issues about its largest uranium mines and projects, Australia has many chances to push forward its domestic uranium industry.